THIS DRESS SOLD. CONTACT SALES@BRIDESFORACAUSE.COM WITH INQUIRIES. 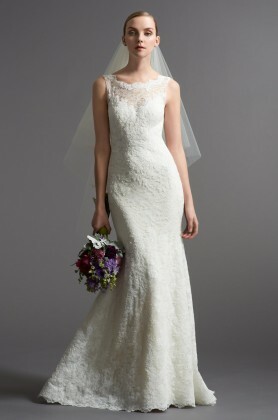 Fit and flare gown with sweetheart neckline and available with corset closure or zipper back closure. Demir Stretch Satin provides sleek luster to this slender silhouette. Ruching envelopes the bodice and asymmetrically plummets below the waist, while the train pours into a gorgeous balloon hem.